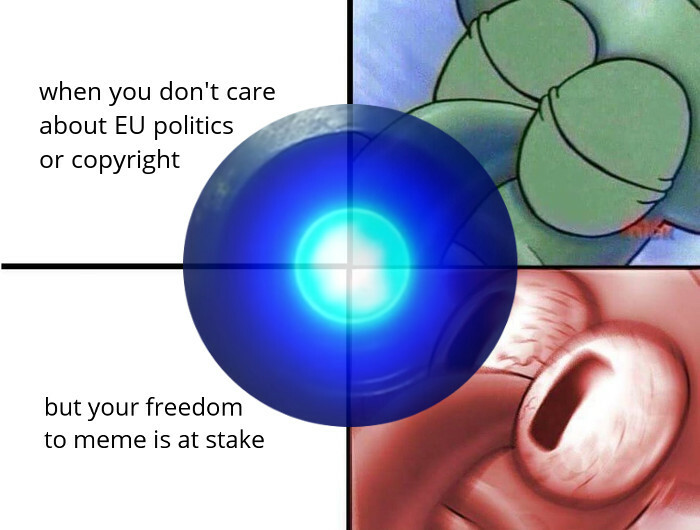 A new copyright reform is going on in the EU. It forces websites to monitor and filter all your uploads (Article 13) and creates an unnecessary and disproportionate new copyright for press publishers (Article 11). It is a huge attack to our freedom to access and distribute information and content on the Internet - tell your MEP to stop this nonsense before 20 June! Copyright-broken Reddit: Reddit-style campaign website to raise awareness on the threats to Internet of the EU copyright reform. Made by Xnet, non Reddit affiliated. Artcile 13 of the copyright reform proposal makes it mandatory for any platform that users can upload content to to adopt automated technologies that scan all uploads in search of content "identified" by copyrightholders to either block it or pay royalties for it. Platforms would be forced to invest in filter technologies for video, audio, images, text, images of text and basically anything that can be protected by copyright or similar rights. The software won't be able to evaluate perfectly legal uses of copyrighted content. This will overturn our rights to quote, parody, criticism, use for education purposes, for reporting current events... and many other common uses nowadays vastly allowed by rightsholders. The censorship machine shoots first and doesn't ask questions later. ...like that Han Solo gif. r/memes, r/photoshopbattles, r/gaming and many others will be hit hard as well as any social media website. The filter applies to all kinds of user uploaded content, including, videos, images, texts, audios, scores, etc. Using automated tools to block content from being created will build an infrastructure of censorship. It is a serious attack on our fundamental rights to free expression and privacy. Copyright as a censorship tool, sounds familiar? What? Is this upload filter even legal? The are two rulings of the European Court of Justice which prohibit the monitoring practices the upload filter will impose on Internet websites. Art. 13 also makes websites legally responsible for the contents uploaded by their users, pushing them to aggressively police and censor uploads to avoid liabilities. This collides against the safe harbor protections of the E-Commerce Directive put in place to protect our freedom of expression. Six Member States have raised concerns about the legality of the proposal in these regards. Yet the EU Commission and Council are still all in for it. The European Commission is hoping that it can exploit a loophole in EU law. Because the proposal is bullying platforms into filtering, rather than explicitly demanding it, the Commission hopes that it can avoid the Directive being overturned in court. The economic cost to implement filtering bots is huge (Content-ID cost $60 million and it is still far from perfect). Established Internet giants such as YouTube and Facebook will be fine but smaller websites will struggle to pay the licenses for it (e.g. from $10.000 to $25.000 a month for Audible Magic) or face legal reprisals. Startups would be hit twice as hard because they would need to explain to potential investors why they will need to massively invest in content filtering, which still might not be good enough for the courts in case of lawsuit. Once these scanning technologies are developed, it is very tempting for our governments to demand that Internet platforms filter content for other purposes, such as (miss-)combating fake news and hate speech; or for repressive regimes around the world to use them to suppress political dissent or enforce anti-LGBT laws or others. It literally always happens that restrictions that are imposed for one reason end up being used for other purposes. Worse still, the EU currently has a strong leadership role in global discussions on internet freedom and fundamental rights. 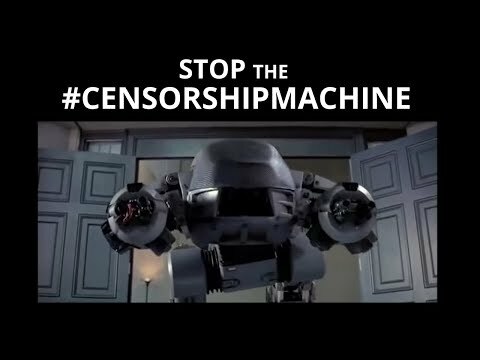 The censorship machine will be used by dictatorships around the world to justify human rights abuses and Europe will be silenced. Europe would be using much of the same technology to limit its citizens’ freedom of expression that is used in China for political censorship. Article 11 of the EU copyright reform proposal creates a new 20 years right for publishers to charge fees for snippets of text that accompany hyperlinks. The so-called LinkTax applies, for example, to that little bit of text that shows up when you share news on Reddit or on social media. Small news aggreggators, social websites, forums, etc. will struggle to find the resources to pay the tax (e.g. using more ads), or face legal reprisals. Only major websites will be able to pay these fees and only major news sites will get linked to, ensuring the dominance of entrenched players. A modern democratic society needs plural and wide access to news and opinions for public debate, the link must be saved. Of course, fake news and state-funded propaganda outlets won't demand payment of the LinkTax. So, the LinkTax will incentivise websites to promote fake news and propaganda. Old media firms are pressuring lawmakers for a law that will restrict linking on the Internet, even though existing legislation of the like have already proven to fail miserably. When a similar law going after Google's money was introduced in Spain, Google News immediately closed and it did not pay a single euro for the tax. Ironically, introduction of the link tax resulted in a 10 percent to 15 percent reduction of visitors, and advertising revenues, for Spanish local publishers (those who lobbied for it, but also those who didn't). Similarly in Germany, publishers voluntarily allowed Google to re-index their sites without payment. After complaining that Google has too much power, the link tax in Germany gave Google even more power. It would seem clear that the LinkTax is a bad measure overall, yet, big publishers hang on to the idea that it will solve all their problems, even if it breaks the internet and curtails our rights. How can we stop this nonsense? The copyright proposal still has to go through some steps before its approval. We must contact our MEPs to tell them that we oppose this dangerous proposals, specially to the ones from JURI, the lead committee. Tell them that Article 11 and Article 13 (and recitals) are a very bad idea that will greatly harm our rights and freedoms, the technological development in Europe and the Internet as a whole. Even if you are not living in the European Union if this mesures are approved, they will set a terrible precedent and will be quickly demanded by copyright lobbysts elsewhere and replicated. 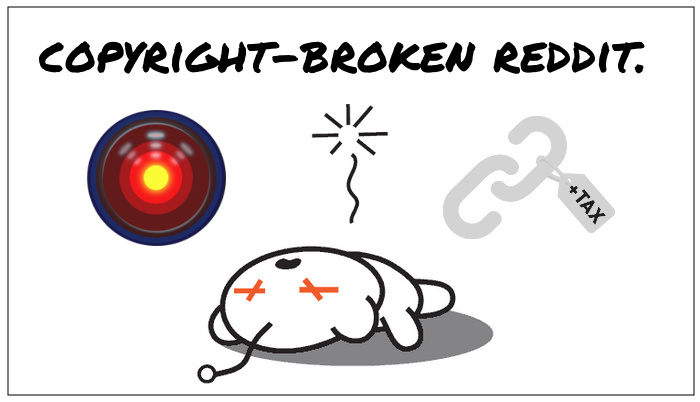 Copyright-broken Reddit is a Reddit-style campaign website to inform about and act to prevent the very harmful proposals of the current EU copyright reform. This site has been created by Alfa Sánchez for Xnet, which has nothing to do with Reddit, we just love it and its community :) The posts, users, comment, votes numbers etc. are all made up.